Do you know anyone who has gone through the process of adopting a child into their family? Maybe the answer to that question is, “Yes… ME!” Or maybe the answer is, “Not me, but I have a close friend…” or “Well, as a matter of fact, we have a family member who was adopted…”. Adoption is close to my heart for many reasons. No, I am not adopted, nor are any of my children. I don’t have any adopted siblings, but I do have several cousins who were adopted. One cousin, Amy, was adopted by my Aunt Carolyn as a baby. Since her adoption occurred before I was born, I have no recollection of Amy NOT being part of our family. I do, however, remember the day she told me she was adopted. We were at her house, playing the game of LIFE, and I was about 8 years old. On her next turn to spin, she landed on the space that says “You adopt twin girls.” As she placed two pink plastic sticks in her already packed plastic white car, she turned to me and said in a smug voice, “You know… I’m adopted.” Before I could even process the words she spoke (Adopted? What did THAT mean?! ), she added, “That means I am your EX-cousin!” I spent the remainder of the game thoroughly confused, but neither anxious nor despondent. I just figured she was being a smarty-pants because she was two years older than me. But this concept of “ex-cousin” was a phrase that stuck with me and now, more than 30 years later, we still call each other “ex-cousins” even though nothing could be further from the truth! As we grew up, I came to hear the story of her adoption (as well as her brother, David) and realized this adoption stuff is something really special. Having a baby born of your body is one thing, but having a baby born of your heart is simply spectacular! 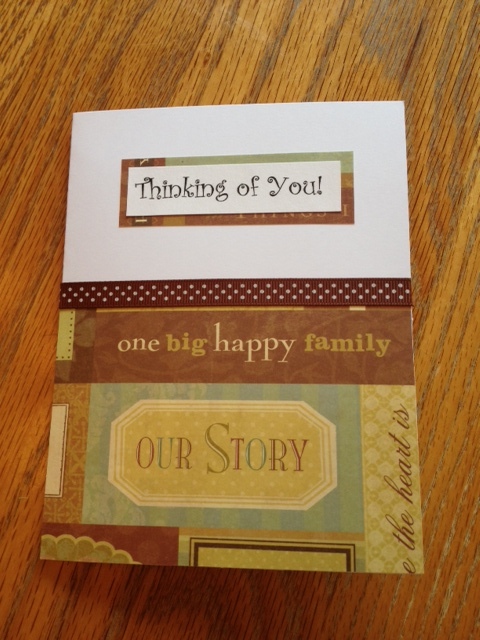 To be chosen… hand selected to join a family… Wow! What an honor! After graduating college and starting my married life, I rode shotgun through the adoption journey travelled by my best friend, Lisa, as she and her husband, Gus, adopted little Christina from Guatemala more than 10 years ago. I also remember the frantic phone call she made to me in 2008, describing two pre-teen girls she met from Florida who were visiting as part of a fostering program: “Oh my gosh, I think I just met my next two daughters! !” Not long after, that vision became a reality as Lisa added Jackie and Julia to her expanding family tree. Adoption seems to be a thread that winds its way through my life. My daughter has told me on more than one occasion that if she doesn’t have a daughter “the natural way”, she will adopt one. A friend from high school shared his adoption joys through Facebook. My sister’s best friend from high school is now engaged to an amazing man adopted from Romania. The pastor who married us 19 years ago had just adopted his first daughter right before my wedding. I love that adoption is not a stigma in our wonderful country… it’s just another way to grow your family! With that in mind, you can imagine my excitement when I read of another friend’s decision to adopt three children from Africa (to join four very excited siblings waiting and hoping!) Desiree and Matt’s journey is detailed through their blog if you’d like to follow their adventures. One downside to adoption is that it can be VERY expensive, especially if you are adopting overseas. With Desiree and Matt adopting not one child, but THREE children, you can imagine the exorbitant costs involved. 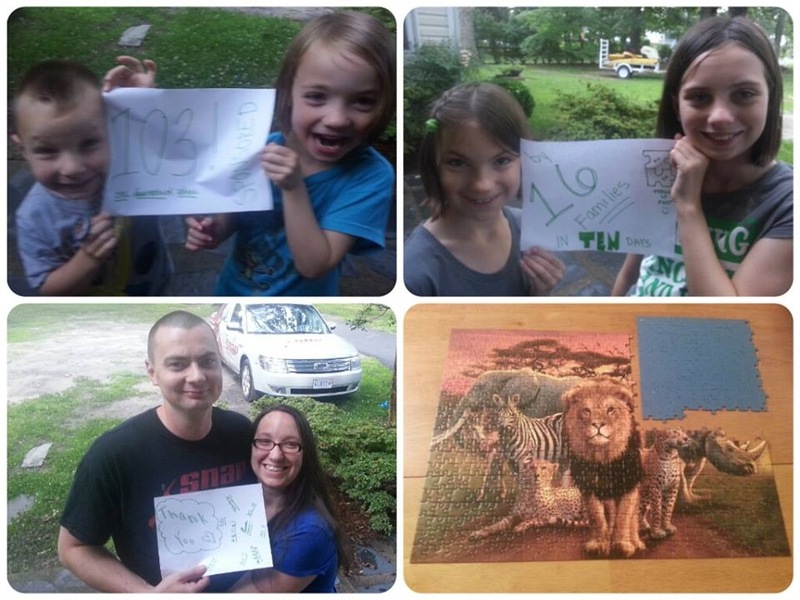 They created a unique fundraiser to allow other families and individuals the opportunity to financially contribute to bringing their chosen family together – starting with a puzzle of African animals. 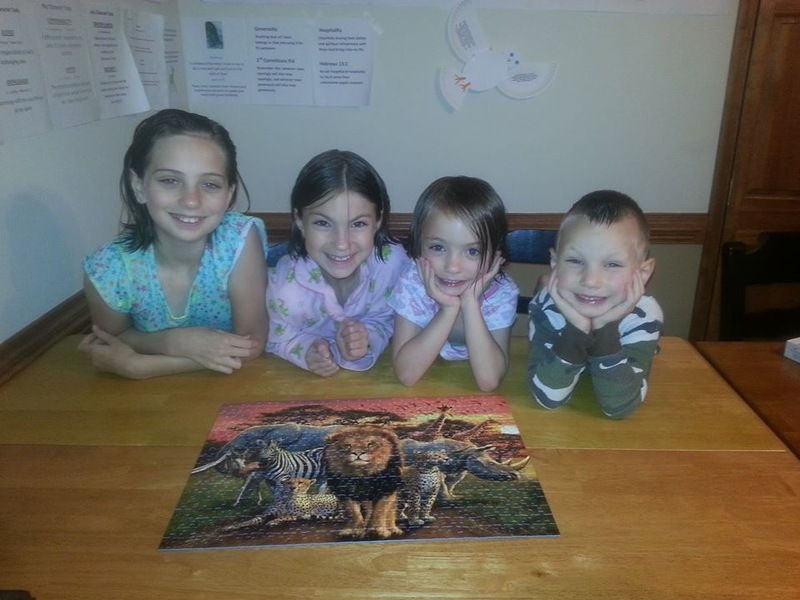 The photo above is of Desiree and Matt’s children after they finished putting together a 500 piece African animal puzzle. 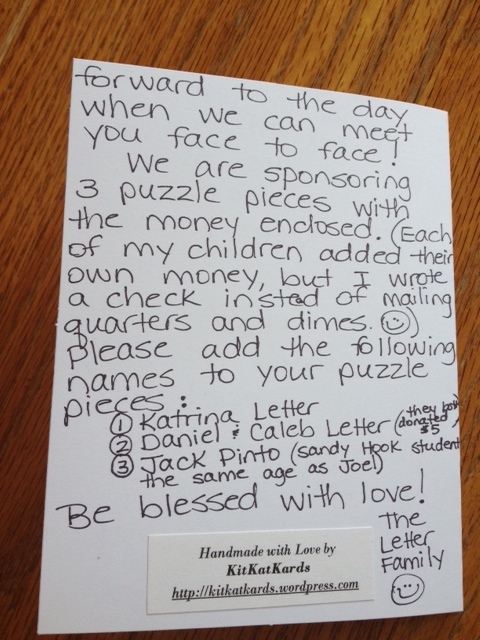 They asked friends and loved ones to support their journey by sponsoring a puzzle piece for a suggested donation of $10. 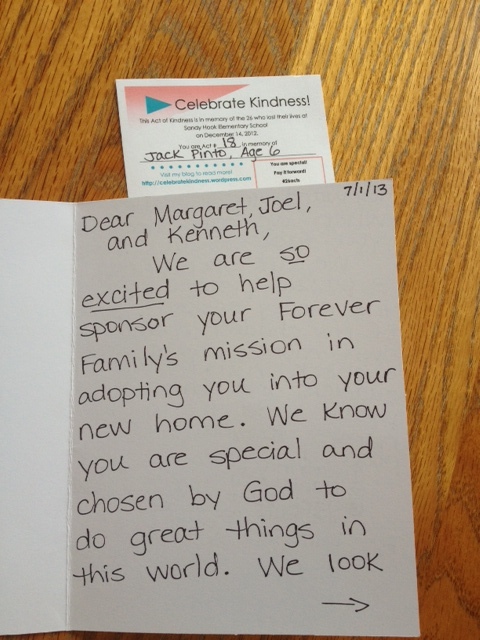 Each time they receive a donation, they write the person’s name on the back of a puzzle piece so that when completed, their adopted children will be able to see just how many people worked together to make them a Forever family. What a sweet and special treasure! As my children and I were enjoying Game Day last week, I was telling them about the puzzle pieces. “We should do that!” my daughter exclaimed, without hesitation. “Maybe Caleb and I can share a piece. I have $5 I can give them!” my son chimed in. It was a sweet moment to see my children excited to not only help someone else, but to share their money so freely. What a gift indeed! As they brought me their money, I bought one of Katrina cards and wrote a note, explaining our donation. I addressed it to the children waiting in Africa, so they would have a personalized record from one of the many families praying for them. I dedicated this Random Act of Kindness to Jack Pinto, age 6, who was the same age as Joel, one of the boys they plan to adopt. I even requested that Jack’s name be placed on the puzzle piece instead of my own as a living legacy to his memory. I encourage you to listen to the whispers placed on your heart as you go about your day-to-day tasks. Sometimes those whispers are like puzzle pieces themselves, just waiting to be placed a certain way to add clarity and insight to God’s purpose for someone else’s life. You never know if your puzzle piece is the final one needed to complete a masterpiece! Be blessed, dear friends, and thanks for sharing in my RAK adventures!